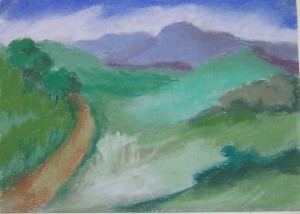 This entry was posted on Friday, February 25th, 2011 at 8:22 pm	and is filed under 100 Pastel Challenge, Color, Landscapes, Paintings, Pastels. You can follow any responses to this entry through the RSS 2.0 feed. You can leave a response, or trackback from your own site. Very pleasing to the eye, these colors. Soft and calming. Thanks. I was pretty tired when I did it, so maybe it shows in the painting. if I had my druthers, it’d be hiking up that path!